Remember when you were a kid, and anytime you got a hamburger or cheeseburger was wonderful – regardless if it was super plain and boring? I loved having burgers for dinner, but now as an adult I sure do expect more FLAVOR and ‘personality’ to it. Gone are the days of bland, typical burgers now that you can whip up this Gourmet-Style Garlic Jalapeno Burger and Fry Sauce easily at home! It’s bursting with incredible flavor, and is a truly special sauce that takes your burger from ‘eh’ to WOW! Don’t worry, y’all know how much I try to avoid complex dishes or meals that take too long – even though this Garlic Jalapeno Burger may SOUND difficult or time-consuming, it’s not at all! Just grab all of your ingredients during your next Walmart shopping trip – including the ‘secret ingredient’ that makes this sauce finger-licking good….NEW McCormick Garlic Jalapeño Seasoning. It’s one of the NEW McCormick Garlic Seasoning Blends now available at Walmart, and boy does it give such an amazing flavor to so many dishes – I had to stock up on several so we can try it out on more new things. You can find it in the spice aisle, along with McCormick Garlic Ranch Seasoning. You can use either of these tasty seasonings anywhere you’d normally use Garlic Powder – add it in before, during or after cooking for an extra boost of flavor. They really bring garlic to the next level of flavor, and help take the guesswork out of recipe free cooking – because who wants to stick exactly to a recipe all the time?! I love using McCormick seasonings because they inspire a love of home cooking and help empower all cooks (even those still learning, like us) through flavor! 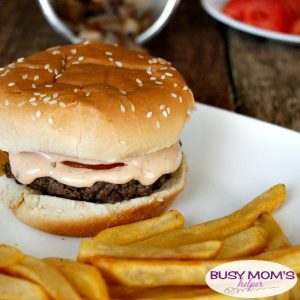 Seriously, this sauce takes these burgers far away from the regular ‘ol bland stuff and gives them a boost of flavor that really goes well with the burgers and toppings – plus it works amazingly as a fry sauce, so you get two uses from one sauce! It just so happens that hubby had to work from home the day I made these, meaning he was able to taste-test my creation – and absolutely loved it! He even packed a bit of the leftovers for lunch the next day because it was such a hit 🙂 He was sure glad I bought several of the McCormick Garlic Seasoning Blends, since he’s also brainstorming on more things that it can be added to for some really great flavor. Just look at that sauce dripping on the burger – so much great taste in every bite! Like I said, don’t worry because it’s really easy to make…. In a bowl, whip all of your ingredients until well-combined. Use as a sauce for your burgers, and a dip for your fries. At first I was worried that using the same sauce for the burgers and the fry dip would be ‘too much’ – but goodness no! It was perfect, bringing out great flavor for each thing in a complimentary way. Loved it! Once you fall in love with the taste, you’ll want to sprinkle it on new things to try as well – I even sprinkled some into the actual ground beef patties of our burgers! You can adjust the amount of seasoning you put in to fit your taste preference – it was still great with just 1 tsp. in the sauce, but for the better flavor we wanted we preferred 2 tsp. in ours. Mmm….this sauce was almost addictive, it was just so tasty! And yes, it’s so good you’ll be licking your fingers (and maybe even your plate)! I’m so glad I’m not a kid anymore, happy with a regular, bland burger – I want delicious flavor bursting in every single bite! These gourmet-style Garlic Jalapeno Burgers are just what the doctor ordered, and still were quick to fix up because us busy mommas deserve great taste without spending our valuable time! What dish would YOU try NEW McCormick Garlic Jalapeño Seasoning in? You know, I always think that life is crazy and just couldn’t get busier – then it proves me wrong and our schedules get even more insane. Luckily there’s some delicious, go-to foods I can rely on for those nights I don’t have a ton of time (like most nights!). 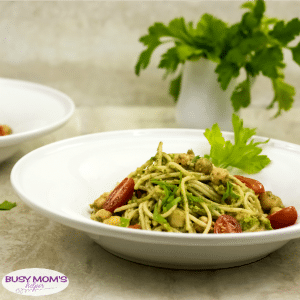 If you’re in a rush for mealtime like me, you can whip up a ton of amazing, Easy Meals with Noodles and have a little more time to tackle that to-do list! So why noodles, you may ask? I love that they’re so versatile – while people may think only of stroganoff or casseroles, they can be used to whip up so many more varieties of meals. 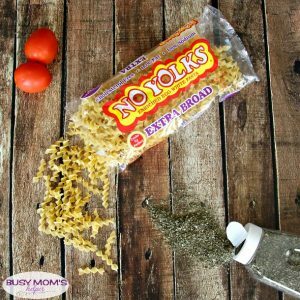 I grabbed a bunch of No Yolks noodles at the store so I’d have plenty on-hand for the busy fall we have ahead, and can’t wait to try them in tasty dishes like Sriracha Cheesy Noodles, or even Noodles with Kale and Walnut Pesto. You can even nab a coupon for $0.50 off when stocking up on our own No Yolks Noodles! I love that No Yolks is a healthy egg noodle alternative – it’s made from eggs whites so has no cholesterol. They’re low in fat AND sodium, and always cook up smooth, firm and fluffy because they’re high-quality. With all their varieties – like Broad, Extra Broad, Fine, Kluski, Dumplings and even Stir-Fry – you can use them in all sorts of unique, simple and easy-to-make meals. Give them a try in your favorite soup, like Miso or French Onion even! Want a chance to win one of Five (5) $100 gift Cards? Enter from October 3rd – November 15th, 2017! Stock up on your favorite type of No Yolks noodles the next time you’re at the store (don’t forget your coupon for $0.50 off!) and you’ll be all set for those busy nights when you want a delicious, amazing meal to feed your family but don’t have a ton of time to spend in the kitchen. You’ll be surprised at how many different dishes you can whip up with noodles, so don’t be afraid to try something new! 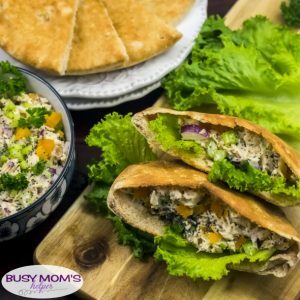 If you’re looking for something a little different than your typical sandwich, these Poppy Seed Chicken Pitas are just the ticket. Fresh, flavorful with a perfect texture that’ll leave the whole family asking for more. They’re also easy to make ahead of time, so putting them in lunches for school (or work) make the morning rush a little bit easier! In a large bowl, combine the orange juice, mayonnaise, mustard, poppy seed, salt and freshly cracked pepper. Whisk until smooth. Add the chicken, celery, onion, walnuts and apricots into the bowl. Toss it well with the dressing, till everything is well mixed. Taste and add more salt and pepper, if needed. The chicken salad is ready. Chill for at least 30 minutes before serving. To serve, toast the pita halves in a toaster oven for 2 to 3 minutes at 400 Degrees F.
Stuff the toasted pitas with torn lettuce and about ¼ cup of the poppy seed chicken salad. Serve immediately. The chicken salad can be prepared ahead of time – it actually tastes better the next day& makes great leftovers, too. Shredded rotisserie chicken, poached or grilled chicken chunks can be used, too. Instead of dried apricots, dried cranberries or even raisins can be used. Instead of walnuts, use any nuts of choice like pecans, almonds or hazelnuts. If allergic to nuts, pepitas/pumpkin seeds or sunflower seeds are good alternatives. What’s your favorite type of chicken salad? This great, time-saving service and recipe is brought to you today thanks to Skinner® pasta. All opinions are mine alone. Did you know about National Friendship Day? It’s true – and what better way to celebrate or show appreciation for a friend (or two) than telling them about a great service that can save them plenty of time and even money? To all my busy mom friends out there, here’s my gift to you – Why Instacart is Perfect for Busy Moms! One of the best gifts us busy moms (and dads!) can receive is the gift of time – and grocery delivery can be the ultimate lifesaver. I don’t know about you, but skipping the hassle of getting all the way dressed, heading to the store, finding the items, checking out, and driving back sounds like a miracle – and it’s easy to get! Skinner® Pasta – the #1 pasta in Texas – is partnering with Instacart to offer FREE grocery delivery (or $5 off your total grocery bill) beginning last week on August 6th in celebration of National Friendship Day. Imagine, all your groceries delivered right to your door, and you can even stay in your pjs! Not only can you get quick, convenient grocery delivery with Instacart thanks to Skinner Pasta, but they’re also holding the Howdy Skinner Sweepstakes – a Texas-sized getaway and other fun prizes sure to make anyone smile. If you win, you could share the trip with your own best friend! Visit HowdySkinner.com to enter, and you’ll have a chance to win a 3-night stay for you (and a friend, of course) at the Marriot Marquis Houston – that includes airfare and $500 spending money for seeing the sites, hitting up restaurants and attractions or a fun shopping spree! Other fun prizes include membership to Care.com and $500 – giving you more ‘me’ time by handling dog walking, babysitting and housekeeping services – or you could win FREE PASTA for a year for you and a friend! The sweepstakes kicked off on National Friendship Day (August 6th) and ends 09/06/17 at 11:59:59pm CDT. See details and official rules at HowdySkinner.com. As part of their partnership with Skinner, Instacart is giving free grocery delivery for customers in Houston, Austin, San Antonio and Dallas. All you have to do is buy ONE package of Skinner Pasta and have a minimum $35 order. Those who don’t qualify for free delivery (if you’re already an Instacart Express Customer or a first time customer) will receive $5 off your order (delivery must be $35 or more to qualify). This goes great as a topping for your favorite Skinner Pasta – whether you use spaghetti like we did here, or their fun Texas shape pasta! Skinner Pasta tastes great and is easy to cook with; it always turns out right. Not only is it gentle on your wallet, but it’s so flexible – allowing you to make all sorts of delish recipes in a hurry for those busy family nights or get-togethers with friends! Who would YOU share the Houston trip with if you won? 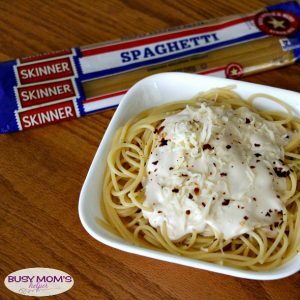 Thanks to Skinner® pasta for sponsoring this recipe. All opinions are my own. As a big family of 7, having great go-to dinner recipes that are not only delicious, but also quick are a necessity. One thing we rely on to make our evenings less of a stress are excellent pasta dishes, like this amazing Fajita Pasta Casserole! It’s simple to make, doesn’t take much time, and is so full of flavor that it’s a hit with the whole family. Why do we make pasta dishes so often for our family? Because it tastes great, is flexible for a TON of great recipes, and it’s great for any budget. That’s probably one of the reasons Skinner pasta is the #1 pasta in Texas – everyone loves it, it’s so easy to cook and has earned Non-GMO Project Verification on their most popular pasta products. Skinner pasta has a variety of pasta products available, such as spaghetti and fettuccine, elbows and penne (our favorite) and even options like dumplings and super fun Skinner Texas Shape pasta! I couldn’t resist using those to whip up this Fajita Pasta Casserole, since they’re so cute. Since people have different favorites in which variety of pasta they prefer – for us it’s penne, for some it’s spaghetti – you can switch this recipe up to include whichever Skinner pasta fits your style! If you’re a proud Texan like us, maybe you’ll even choose the same style as we did for this particular recipe. Season the chicken pieces with half the taco seasoning. In a medium skillet, heat 1 tablespoon olive oil over high heat until very hot. Carefully add the chicken in a single layer and cook WITHOUT STIRRING until one side is seared and browned, about 1-2 minutes. Turn the chicken over and cook the other side the same way, until browned. Remove the chicken to a plate and set aside. Add the remaining 1 tablespoon of olive oil to the skillet with the heat still on high and cook until really hot. Add the onions, bell peppers, and last of the taco seasoning. Cook, now stirring occasionally, until the veggies are starting to blacken a little bit. Turn heat to low and add in the garlic. Stir until well-mixed, about 30 seconds. Place the veggies onto the plate with the chicken. In the same skillet, mix the broth, cream, tomatoes, UNCOOKED pasta, and salt. Stir until well-combined and bring to a boil, then reduce heat to medium-low, and cook COVERED for 15 minutes, or until pasta is tender and liquid is mostly absorbed. Mix the chicken and veggies back into the skillet until well combined and heated through, about 2 minutes. I love serving this dish to my family because everyone loves it, and it doesn’t take me much time or effort – great for a busy weeknight meal! It’ll especially come in handy when we’re back to school in a few weeks and our schedules get even more crazy. What pasta style/shape would YOU choose? It seems like a major food-craze that hasn’t gone away in past years is BACON. People love it – and for good reason, since it’s downright delicious! 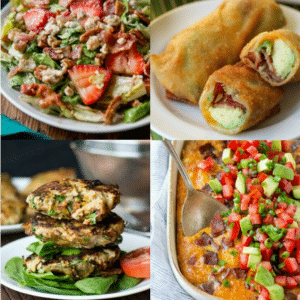 Here we’re sharing 20+ Irresistible Bacon Recipes, with everything from breakfast, sides, rolls, snacks and more to fit into your bacon craving any time of day. I love family get-togethers, and summer seems to have many more opportunities for these than normal. For us, it has to do with the fact that most of our family lives in a different state, so summer trips bring us together. While quality time with loved ones is great, it seems some of the most memorable moments are around a great meal. This summer is no exception with one of our new family favorites – these delicious and easy-to-make Marinated Sausage Kabobs! What better time to share this new, tasty recipe that our family is going crazy for than right in time for What’s Cooking Wednesday? I’m sure y’all have plenty of occasions this summer – or anytime of year, really – when a quality meal with those you care about is just the ticket. I love using Klement’s Sausage – their fully cooked and hardwood-smoked dinner sausages provide the rich, robust taste that makes this recipe a winning dinner. Their authentic European handcrafted sausage has been bringing people together for generations – I mean, what better time than during a great meal to help busy households slow down and (literally) savor the moment together? When we first served these sausage kabobs to our kids, I was afraid they’d be picking out all the pineapple to eat first because I assumed that’d be their favorite ingredient. Nope – they were begging for just more of the Klement’s sausage pieces! They absolutely loved all three of the dinner sausages we tried – the Smoked Bratwurst, Polish and Cheddar Bratwurst. Hubby and I couldn’t pick my favorite of the three, either, because they each had their own take on that great, Old World flavor and authentic taste you appreciate in European recipes. 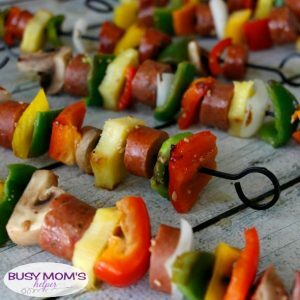 Not only are these sausage kabobs a crowd-pleasing favorite in flavor, but they don’t take much time at all. Plus, it’s like a family event BUILDING the kabobs – each person selecting which ingredients they want, creating fun patterns if they like, and truly making it not just a meal, but a memorable gathering full of conversation and fun. Produce of Choice: Colored Peppers, Onion, Mushrooms, Pineapple, Zucchini, Squash, etc. Dice all of the ingredients, including the sausage, into large pieces. Be sure you’ve pre-washed the produce. Build the kabobs as desired, lay on a tray. For the marinade, mix equal parts red wine vinegar and olive oil. Per cup of this, add about 1-2 tbsp. minced garlic. It doesn’t stay mixed, so you’ll need to stir often. Use a basting brush to baste each of the kabobs. Grill until vegetables are tender, or cook in the oven (350 Degrees F) on a baking sheet lined with foil about 10-20 minutes, or until veggies are tender. Note: if you don’t have kabob sticks, or are in a bigger hurry, just dump all the diced ingredients into a sprayed baking dish, stir in the marinade, then bake at 350 Degrees F about 15-25 minutes or until vegetables are tender. Whether you’re having a weekly family dinner, a summertime gathering with relatives, or even just a random meal at home, these Klement’s sausage kabobs are full of flavor and perfect for spending a delicious meal with those you love. Search #WhatsCookingWednesday for great new recipes every week! As a busy mom, y’all know how much I love easy-to-make dinners, right? The problem is, I don’t want just ANY simple recipe, I want something that tastes amazing and that my whole family will enjoy. That’s one reason I love today’s recipe – you can whip up this Delicious Chicken Pasta Casserole 3 Ways – making it appeal to any of your family’s tastes, and giving you a great meal without the hassle! You don’t even need a lot of ingredients – just swing by Walmart to grab the few you do, then enjoy this anytime of the week. Don’t forget to stock up on the NEW P.F. 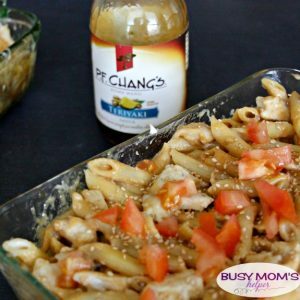 Chang’s® Home Menu Sauces exclusively at Walmart, which you can find in the Asian food aisle. These sauces are the simple secret to extraordinary flavor in your favorite recipes, and contribute to Asian cuisine made simple. We all love simple recipes, right?! These are also key to doing our Chicken Pasta Casserole 3 different ways – using their Teriyaki, Sesame or Kung Pao sauce to switch it up. Preheat oven to 350 Degrees. In a shallow bowl, mix the flour with a bit of salt and pepper. Slice the chicken into thin strips, then coat each with flour and lay on a baking sheet covered with foil. Bake for about 20 minutes, or until chicken is cooked through. While chicken is baking, cook pasta according to package directions. After drained, pour pasta into a sprayed 9×13 casserole dish. Stir in the alfredo sauce, then the P.F. Chang’s® Home Menu Sauce of choice, to taste. Once chicken is done, dice then stir into casserole along with any veggies/toppings you prefer. Cover with foil and heat in oven at 350 Degrees about 5-10 minutes, or until everything is heated throughout. Enjoy! …while the kids were torn between the Sesame and the Teriyaki. 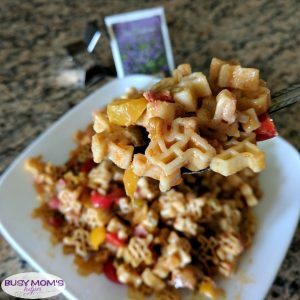 Whatever your family’s preference, this chicken pasta casserole is a huge hit – and it’s even better because you can customize it using these incredible sauces to fit anyone’s tastes! Check out the fun Sweepstakes & find more Asian recipe inspiration HERE! I absolutely LOVE a good smoothie bowl recipe. I remember the first time I ever tried one – at a hotel in Beverly Hills on a press trip, and their Acai version sounded completely delicious for breakfast – and it was! 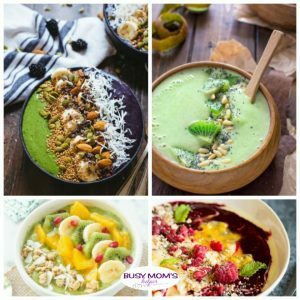 Ever since I’ve enjoyed all sorts of smoothie bowl recipes, and here’s 23 Delicious & Nutritious Smoothie Bowl Recipes to add to the list! I thought this would be a little change from the healthier chocolate smoothie bowl recipes I shared before, and give you even more choices for a tasty breakfast, snack or heck – even a dessert! Anytime is a good time for a smoothie bowl, so pick one to try and enjoy! Do you have picky eaters in your home? My kids do fairly well – but they’re still kids so of course there’s plenty of delish food that they just refuse to eat. I think it’s a trial all parents must go through – getting our children to eat a variety of foods, and hopefully some healthy ones like fruit! 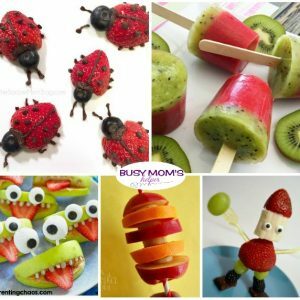 To help you with your battle, here’s 20 Creative Snack Ideas with Fruit – make mealtime or snacktime fun again with these clever fruity creations! Which creative snack idea is YOUR favorite? Another holiday has come and gone and while it’s nice to indulge a bit (can you say chocolate bunnies? 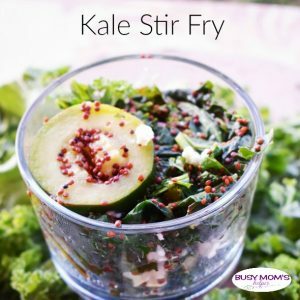 ), I always feel so ready to eat a little healthier after all that comfort food, and this Kale Stir Fry recipe is perfect for a healthy snack or side dish! If you’ve never made stir fry at home, let me tell you just how simple and delicious it is. Did you know they even make stir fry veggie kits in the freezer section of your grocery store? It couldn’t be more simple to put together a healthy meal for your family, or even a quick and easy lunch for just you! I love this version because it’s full of yummy green veggies, bright citrus and a flavorful cheese – feta! Scroll down for the recipe. Follow directions of making quinoa. On medium heat in a large pan add olive oil. Add onion and zucchini and allow to cook until tender. Allow to steam for 5-10 minutes until kale is tender. Top with Feta and lemon juice. Have you ever tried making stir fry at home?